Whenever I give a tour of my beeyards, I tell the story of each colony, and get to relive the excitement (or frustration) of how each one came to live with me. For example, one of my favorite colonies is one that I call “The Spool” colony. Back in June, someone from Verizon called me about some bees that moved into a 650 lb. spool of steel wire. 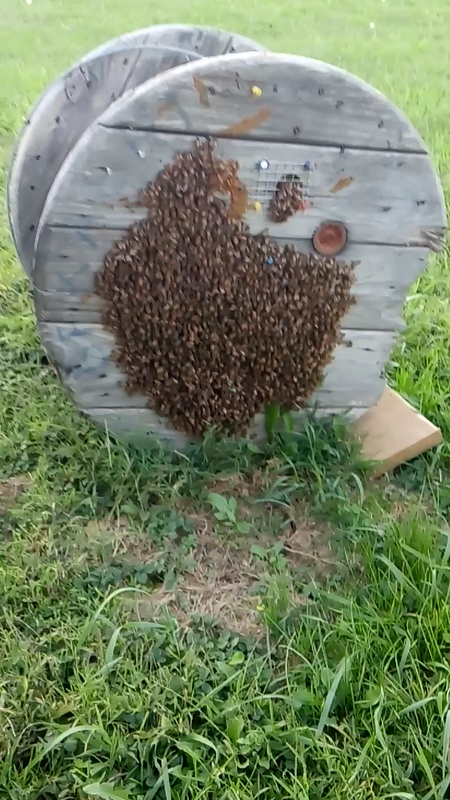 Some workers found the bees buzzing around the spool and began searching for some wasp spray. Luckily, they asked their supervisor (a bee lover) for the spray. He told them not to spray the bees and immediately put a sign up by the spool to stay away, and then somehow found me. I came by to look at the bees and form a plan as to how I was going to get them out of the spool. After explaining all the usual methods of removing bees, the supervisor said, “Can we just bring the spool to your house?” Well, there’s an idea. The bees were in for a bumpy ride, and were pretty mad upon arrival, but have been just fine ever since. I have no plans of removing them now, and will just let them swarm this Spring and hopefully be around to capture them. Another colony I call my “Power Plant” colony, came to me as the result of a blown-down tree in the shadow of the Limerick Power Generation Plant. (Video) The tree pretty much exploded on impact, and comb was scattered everywhere. Animals drug away most of it, so all that was left was a large cluster of bees. Interestingly, in this same tree was a very active nest of European Hornets, and a large Baldface hornet nest was a few feet from that. In the ground nearby was a yellow jacket nest just for good measure. I managed to get stung by a European hornet and it nearly knocked me over. There were many dead laying all over the ground, but not honeybees. Somehow, these bees were killing the hornets in impressive numbers. I lured the bees into a hive and left them there for a week to rob out what was left of their old cavity. I wasn’t sure if I had the queen until a few weeks later when I saw her during an inspection. They have kept up their wasp-killing ways here at home and have none of the issues with yellow jackets that some of my other colonies do. The reason I tell these stories (and titled this post this way) is because I love that all my colonies have such stories to tell. When I visit other beekeepers, I always ask where their bees are from. So often, all I hear is, “They’re from a package”. I hope that more people start to realize that packages aren’t the only way to get bees. Bees are free, but you have to get out there and earn them. Don’t let your story be “They arrived on my doorstep via US Mail for a hundred bucks”. No one wants to hear that. Tell me your bee’s stories in the comments. My best survivor bee hive came from a parking lot curb At a uhaul rental place in the city. The colony had swarmed from some nearby hive landed on the side of a uhaul truck couldn’t get a grip and slipped and fell off the shiny metal truck onto the curb. I gently dragged my finger through the swarm until I found the Queen . I picked her up and put her in a nuc Box. The rest of the bees walked into the nuc Box. Soon it was dark and I was able to bring my new colony home where they have done quite well for 3 years now.